Hello dearest all hope you're well. Today I am writing about something I observe about fur, faux fur of course. People love fur but are reluctant to wear it thinking it will make them look bulkier especially if one is not slim. There is a common view that fur looks good only on slim body. I beg to disagree. I am not slim but i still wear it with absolutely no qualm. I just love the oomph factor it gives to any outfit. I enjoy the feel of its texture & the warmth it gives. And it doesn't make me look odd because no matter if I am slim or chubby fur always make the wearer look bulkier. That's the secret! And yeah wishing y'all a very Happy Valentine's Day!!! aw that's such a nice fur coat. it's so snowy white, just perfect! also love how you styled it with this dress! First, I need to compliment your best accessory in this look and that's your confidence! I'm so glad that you shared how you embrace your body and wear your favorite faux fur pieces regardless! You're right, everyone looks bulkier in fur, there's definitely no getting around that. Now, onto your outfit :) I adore that dress, girl! The color and print are so lovely and give off that perfect boho feel, such an awesome trendy piece! I also love how the fur looks with it of course :) Thanks so much for sharing and I hope you have the best start to your day, beauty! I am in love with this amazing fur vest! Beautiful look! I love the fur vest! I'm a super lover of faux fur garments, and thsis eason the vests have become my obsession!! Great look!!! I agree, everyone looks bulkier in fur. It suits you perfectly and you look beautiful and glam! Love the outfit, you look so beautiful! LOVE your look and the outfit. You totally nailed boho chic with this look. Love the dress too! Such a gorgeous outfit, love your accessories! Wow, nice look! I am in love with your bag. I love your fur and that dress is too cute!! Wonderful outfit! You look chic and classy! I love this look and that bag...wow !!! Hey Eva, great pictures and a lovely blog! What an inspiration! Keep up the good work! Much appreciated! 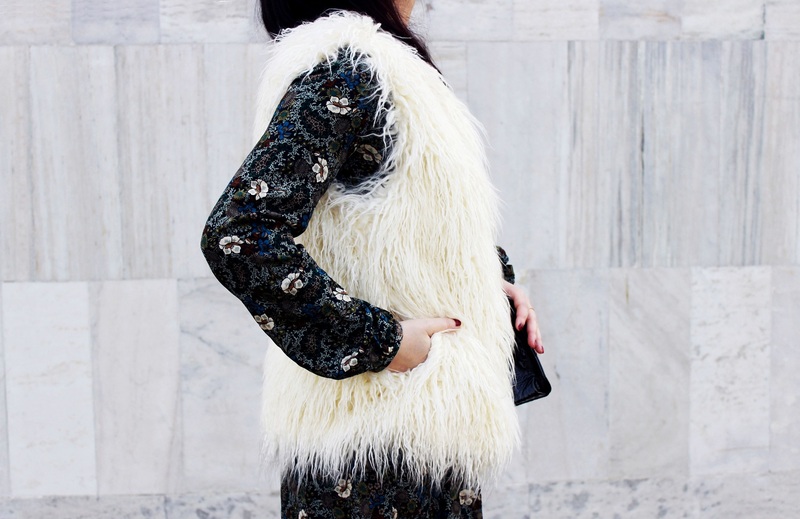 I am swooning over your faux fur! You look so gorgeous. Regardless of peoples view, you look amazing and so good that you don't let that hold you back from wearing something you love. I am still looking for the perfect fur and can't wait to rock it when I do. Hope you're having a great weekend love. Amazing photos, I really love the dress! Great pattern! Elegant is the word . That vest is super cute! I have yet to get a cute faux fur vest. Cute dress & I absolutely love faux fur! Love this look and that vest is gorgeous on you! I totally agree with you! And this outfit is so amazing !! Love the texture and colour of the whole ensemble. It looks luxe and classy. I love how you have mixed print with all different textures in this look. Very chic! Beautiful outfit and great details! Looking soo glam and chic here!! Wow I absolutely adore it.